What is the Helix HD? Helix HD is an affordable, portable & lightweight HD video magnifier with an easy to use wireless control pad. Its unique dual-camera system offers a complete solution for users requiring full page width magnification of any text or images up to 150x (24” monitor). Its compact and portable design makes it easy to move between multiple rooms & between home & work. Who is the Helix HD for? If you’re struggling to read text & need something more powerful than an optical magnifier, the Helix HD could be the ideal solution for you! 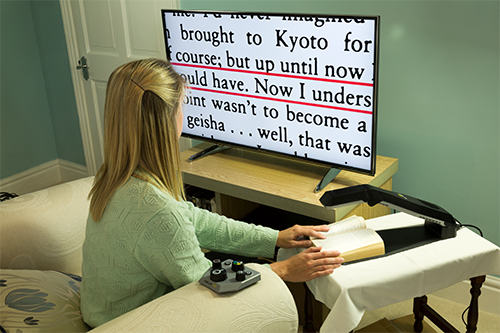 With magnification of up to 150x, enhanced reading colours, lines, blinds & unique signature box, everyday tasks that were difficult are now possible again; such as reading books, post, bank statements, cooking instructions & writing letters, cards, crosswords, sudoku etc. Helix HD is light enough to easily move around the home or office & connects to any television or computer monitor via an HDMI / DVI connection. With Helix HD’s integrated output selector, you can connect your PC, laptop, Mac or set-top box etc. to the same screen as the Helix HD & instantly switch between them using the dedicated button on Helix HD’s control pad. It has a simple tactile control pad which makes is easy to operate. Are finding it difficult to read even when holding things close to your eyes. Are finding it difficult to read with a magnifying glass. Would like to be more independent and be able to read your own documents (post, newspapers, bills etc). Would like a portable solution that you can use around the house and at work. Have dyslexia and find that changing the colours of text make documents easier to read. What are the Helix HD’s benefits? High Magnification range: Smooth, continuous zoom from 2.8x to 150x on a 24” screen. Fast 60 frames per second HD cameras allow reading at high speed with no blurring or ghosting, making reading faster & more pleasurable. Enhanced Reading Colours Dramatically improve contrast when reading. 8 colours plus a user selectable colour are included. Easy to use Control Pad:Helix HD’s easy-to-use, 6 control, tactile wireless keypad enables instant access to all its main features. If further simplification is required, simply attach the magnetic overlay to reduce the controls to just 2. Freeze frame function:Instantly freezes image on screen. Perfect for phone numbers, addresses, tins of food etc. Dedicated Output Selector:Just press a button to switch between the Helix HD or another video device on the same screen. Small Footprint: Occupying just 40 x 15 cm (15.7 x 5.9 inches), Helix HD takes up far less space than traditional video magnifier solutions. 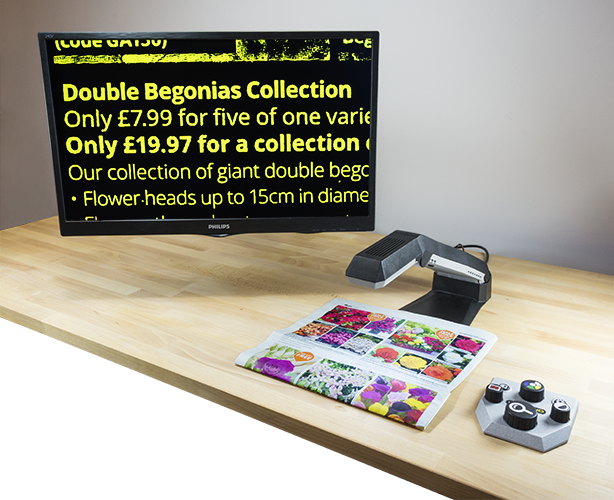 Lightweight & foldable:Unlike traditional desktop video magnifiers, the Helix HD weighs just 1.1kg (2.5 lbs) & folds to just 8cm (3.1 inches) thick which means it’s easy to store away or transport in the optional carry bag.